Rachel, who has been running since she was 10 years old, started competitive running after she ran her first cross country event and loved it! She initially started running just to get fit for other team sports, but after being pretty successful with cross country, she was encouraged by her School Principal, Bruce Torrens and PE teacher Matt Brown, to have a good go at running as a sport. Her main goal now would be to make the Queensland team again this year, improve her times whilst keeping up her fitness and continuing to enjoy running as well as the other sports she plays. Rachel enjoys a wide range of sports including dancing, competitive swimming, soccer, touch football and athletics. She loves playing all sports but long distance running is definitely her favourite. When she’s not training with her running club, Peak Performance (Coach Wally Plath) and friends Jamie and Layla Sanders, she’s running around at soccer and touch football training/fixtures….so she’s pretty well active 24/7! Rachel is very committed to training and believes you must enjoy your chosen sport to get the most out of yourself. Running in nice places like her home base at the Pioneer Valley and with good company makes training a lot easier. When Rachel first started running, she would get very nervous before competitive races, but the experience of being in a club like Mackay Road Runners has definitely given her the confidence to race at big events such as the State titles. As a year 10 school student at Mirani High, fitting in running training between study, time with friends and other team sports makes for a very busy schedule, but Rachel feels pretty lucky to have a lot of support from my family and school. Rachel is a very gifted runner who is held in very high regard by her peers at school and the various sporting bodies she is involved in. Sarah has been running for approximately five years and has already completed two half marathons and a wide variety of smaller runs. 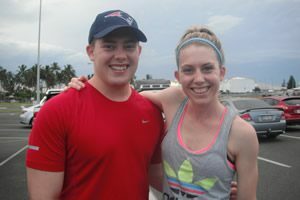 Charlie, who never really ran much before, started running with Sarah, in a bid to maintain his fitness as well as increasing his endurance in the many events he has done thus far. Sarah’s main goals are to strive for under two hours for her next half marathon which will be at the 2016 Mackay Marina Run, whereas Charlie, who will also be trying to break the two hour barrier, is more keen to get a win over Sarah. Both runners love their sport and are very talented basketball players, having played for several years as well as being devout Hawthorn supporters. Charlie and Sarah try to run three times a week, whether it by themselves or with a running group. They both love the support of a group environment and have found the Mackay Road Runners Club very welcoming and fantastic with their encouragement and support… especially in events such as the recent 21.1km Eungella Trail Run, where they had doubts about entering such a technical and tough course. They both did extremely well in the event, with Charlie super keen for next year! One of Sarah’s biggest motivators is to get a win over the old man, whilst Charlie feels grateful when he thinks of friends who are no longer here and how lucky he is to have the choice. Charlie admits he would like to develop better nutrition, but he tries to convince himself some bad habits are ok if he runs, then he doesn’t feel so guilty. They both agree that juggling family and work is a challenge, but it’s very important to make time to exercise, no matter how far the distance or how fast or slow. Best wishes to Charlie and Sarah on a personal best time under two hours at the Mackay Marina Run. Kylie has been running for about 8 years alongside her husband, entering different events and being involved with the Mackay Road Runners. She has completed the Gold Coast Marathon, Hamilton Island Hilly Half Marathon, Townsville Half Marathon and The 28km Run the Great Whitsunday Walk. 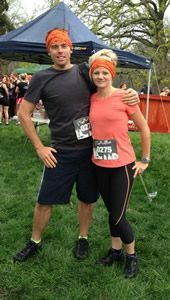 She started running because she wanted to get fit and her husband also has a passion for it so she followed in his footsteps. It makes it easier to train and to be more motivated to run with family support and to have a goal in sight. Within the last three years she has had two children and hasn’t been running as often as she would like. The 2014 Mackay Marina Half Marathon was the last big event so the two goals she wants to accomplish this year are the Hamilton Island Hilly Half Marathon (May) and the Mackay Marina Half Marathon (June). To prepare for this, she has been trying to run every second day (7km to 10km) with a longer run on the weekends (10km to 16km). 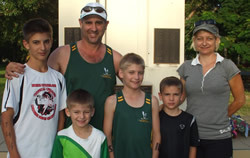 She also attends the weekly calendar runs with the Mackay Road Runners as much as possible depending on the kids. She finds it easier to train and stick to her running schedules if she has a running buddy….this takes her mind off the running by enjoying the company of others. She also tries to fit in a Pilate’s session during the week for core strength work, but the main thing is to just enjoy running and your confidence with running will grow! Enjoy the training! Tim was an avid runner when he was a youngster, competed in the cross country regional carnivals in primary school but never really progressed from there. He entered his first senior event in 2007 when a workmate talked him into doing the Sydney City to Surf. He was hooked from then and has been participating in running events up and down the east coast since. Even though most of his events are on the road, his favourite events are now trail runs. Tim turns 40 this month and wants to celebrate with a big event. He will be travelling to Bright in Victoria to run in the 75km Mt Buffalo Stampede…famously, one of the toughest Ultra Marathons in Australia! He wants to run well in the BMA Mackay Marina Run Half Marathon this year as well. He is currently running as well as ever and feels a PB is achievable. He plans on heading back to Victoria in November and run the 60km Alpine Challenge event at Falls Creek. Prior to running, Tim used to show Australian Stock Horses, for about 10 years. This took up all his spare time and he absolutely loved it. As a teenager, he played Rugby League and golf and currently enjoys playing touch footy with the local Demons team. When training for a running event, he trains 5- 6 days per week including one long run, approx 20km. If he’s not feeling up for a run, he’ll walk or bike ride. He finds running with a group makes you push a bit harder, running by yourself is easier to talk yourself into cutting your run short or not put as much effort in… it happens! Tim finds he needs to always have a goal event planned to keep himself motivated. He keeps a diary and lists the events he wants to compete in. Each year, he selects a run and plans a holiday around it….train hard, enjoy the event and spend a few days relaxing as a reward! Tim recommends a good quality pair of shoes is important, a good diet, but not to say you can’t splurge every now and then. He always wear a GPS watch to record his training, which is handy to look back on periods where you were running well and how many km’s you were doing at the time. Tim is a sales rep, travelling out to the mines, but finds this doesn’t affect his training too much…. the great thing about running…… you can do it anywhere! Lee has been running since he was 17 years old, basically to get into peak physical condition when he joined the military. He started running for fun in his mid-thirties, mainly for various multi-sport and trail running events. Lee has always done some sort of athletic activity, including touch football and squash, however, he now focuses on paddling his ocean ski and riding his bikes. His favourite trail run was the North Face 50km in the NSW Blue Mountains. He really enjoyed both the NZ Coast to Coast multisport event which he did recently and the GeoQuest Adventure race last year….both brilliant outdoor experiences. Although Lee doesn’t need much motivation to train as he mostly does it on his own, he finds training with groups and friends are a great way to involve others and himself in reaching individual goals. Lee doesn’t really follow a formal training program, but alternates between running, riding and paddling, which is great cross training variety that he can mix up so he can do something every day, ultimately keeping injury at bay. Lee recommends not going too hard too early as overtraining can lead to injuries…..give your mind and body time to adapt to changes. Lee also finds adequate nutrition, sleep and planning are critical to performance, just as stretching and sufficient recovery/rest post event are vital. With Lee’s occupation as an engineer, he finds early morning training sessions before the kids are awake works best for him. 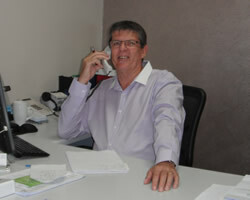 Lee enjoys the comradery of the Mackay Road Runners Club and is looking forward to the upcoming BMA Mackay Marina Run. Last year’s Mackay Marina Run was a very successful outing for Jade Bidgood with him taking out the 5km City Fitness Run in 17.06 minutes & Zoe Bidgood managing to win the under 20 female 5km run in 2013. Jade, Zoe and Rachel normally run a couple of times per week, though Jade is now training more intensively to prepare for the Oceania Athletics Championships in Townsville in early May. In 2014, Rachel encouraged 40 of her work colleagues from Caneland Medical, Sydney St Medical and One Stop Medical to run or walk in the Mackay Marina 5km Corporate Challenge. As well as having fun in a team event, they managed to raise a substantial amount of funds for the Leukemia Foundation, earning themselves a beautiful trophy for their wonderful efforts. They are so looking forward to doing the same again this year. 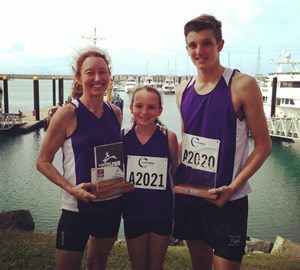 The Bidgoods’ love their running and are great role models for their school, workplace and local community….Congratulations to them on their awesome achievements! The Leukaemia Foundation are the major beneficiary of the Mackay Marina Run and have been since its inception several years ago. The Marina Run committee is made up of many hard working volunteers including Mackay Road Runners members, Major Sponsors and the Leukaemia Foundation. Christine Comben (Secretary/Treasurer), Barry Comben (Publicity Officer) and Damien Carroll (Vice-President) from the Leukaemia Foundation have been an integral part of the Marina Run organising committee, working diligently all year round to ensure the success of the Mackay Marina Run Event so that their worthy charity gains much needed funds to support its many patients and families. The Mackay Marina Run is their major annual fundraising event with tens of thousands of dollars raised via donations from individuals and corporate teams. Christine and Barry graciously donate many hours of their time from one Marina Run to the next as it takes a full twelve months (and more!) to co-ordinate – as soon as this year’s event is run and won, they and their committee will be meeting within the week to discuss what could have been done to improve on the event so that it is bigger, better and more successful in the future. The hardworking duo would love to see their efforts rewarded with many more dollars raised to support the Leukaemia Foundation. And with record numbers expected at this year’s event, possibly close to 3500 runners, as well as the wonderful ongoing support of generous sponsors and individuals, their wishes may be granted. To ensure the continued success of the Mackay Marina Run, Chris & Barry encourage as many people to be involved, either as a volunteer or participant…..all welcome! The event has become the largest, most popular and talked about running festival with many families, corporate bodies and individuals being involved in supporting the beautiful Mackay Region, health and fitness and of course, The Leukaemia Foundation! I have been running for 7 years. I was not a fit person in my younger days. I definitely never considered running as something that I would enjoy. After having 2 daughters, I put on a little weight, so began riding a stationary bike, however, quickly became bored with this and started running laps of my driveway…luckily I had a 56 metre long driveway! It was the best way to exercise and still look after the girls….crazy but it worked! The excitement of running my first 2 km was amazing. As the distance steadily grew over the next couple of years, I began looking for a goal. My first organised run was 2011 Run the Great Whitsunday Walk 28km. What an amazing feeling running with a group of people. The following year I ran the Mackay Marina Half Marathon. (168 laps of the driveway was 20 km). I have now run the Marina run and the Great Whitsunday Walk 3 times and Townsville Marathon twice. It still amazes me how good I feel completing these runs and achieving my goals. Teaching full time and training can be difficult with young children and a husband who is on call with work most nights. I manage to run home from school sometimes and get morning runs in more frequently these days as well as important core workouts. Mackay Road Runners Sunday runs are always great for variety. Staying motivated can be difficult with workloads and family commitments but I love getting out for a run and the feeling of accomplishment it gives me. Running keeps me sane and allows me to set my own goals. I have developed mental strength that I never knew I had. My dream is to one day run 100 kms however, this year I would settle for a sub 3hr 30min marathon and no injuries. I would encourage anyone to try running, just start out slowly and run at your own pace….believe in yourself and enjoy. “My first ever ‘event’ was the 2008 Townsville Running Festival. I drove all the way there to run the 5km event, which I thought was such a big deal! (And it was for me, considering I’d had an ankle reconstruction six months prior!) From then on I became addicted….I’ve since run 11 half marathons, 2 x Hamilton Island Hilly Half Marathons and the Mackay Marina Run which was my very first Half Marathon. I have been running now for almost 8 years! When I was younger I was never much of a runner due to suffering from asthma, but I played alot of sports, mainly Basketball (hence the ankle reconstruction! ), swimming, soccer, baseball, hockey. It was always my husband, Kristian who was the runner. He would run 5km every morning before work and one day managed to get me up to go with him. After not speaking to him for the rest of the day, he knew not to try that again! A year or two later, we moved to Mackay and I had put on a lot of weight. I started going to the gym and got a personal trainer, Marie Muscat, who is now a very close friend. She has a sick way of somehow convincing me to do whatever she says. I have fallen in love with all things fitness and am currently studying my Certificate 3 & 4 in Fitness so I can work in the industry. I had my first baby, Axel last year and started running again when he was 4 months old (thanks to my wonderful husband who becomes Mr Mum every Sunday so that I can attend Road Runners!). Axel is now 8 months old and I am getting ready for my first official running event since having him, which is the Hamilton Island Hilly Half Marathon. I’m participating as a part of team, setting realistic goals so that I am able to achieve them and build from there. After that, I have the “Obstacles Gone Mad” Whitsundays 10km in May which myself and some fellow Road Runner members have entered a team “Mud, Sweat & Wine”! The following month, I have the Mackay Marina Run 8km event and then on the same day, participating in the Hugh Reilly Real Estate team “HR Huff n Puffs” for the Marina Run 5km Corporate event. Erin has learnt what keeps her going are mental checkpoints eg “just make it to that driveway”……..”now just make it to that post” etc… etc…. If you know you’re giving yourself a “reward” you’ll make it and you’ll get further and further before having to rest. Try to push yourself a little bit more each time, but not to breaking point. Set achievable goals so you don’t get discouraged. Everyone has to start somewhere to get to where they want to be. Some get there faster but everyone is made differently and the main thing is that you are out there giving it a go. Keep at it and don’t worry about what anyone else is doing. It’s so hard to start but you feel so good once you’ve finished…that will always spur you on. You CAN do it! Be positive! Nutrition is an individual thing, what works for one may not work for another, however Erin follows a no fructose diet and loosely follows paleo. She mostly eats balanced good whole foods, eg. fruit, vegetables, meat, fish, nuts, seeds and good fats. She drinks LOTS of water and the main thing she’s learnt is you don’t lose weight by not eating. I never miss a meal and have lots of healthy snacks throughout the day. Your body needs to be fuelled appropriately to be able to run and exercise in general. Keeping in mind it’s good to treat yourself occasionally! “I am a happy stay at home mummy as well as a part time student. I have set specific times for training and study and everything else gets planned around that. It is a high priority part of my life, something I love, not just thrown in if I have time, because it would never get done otherwise. I take Axel to Pilates and he comes outside with me when I do other training (usually laughing me). I walk and run with the pram (adds extra resistance, especially going up High St!) and once a week my fabulous neighbours babysit him while I do a ride and swim and on the weekend. Kristian and I alternate looking after Axel – he runs on Saturday while I run on Sunday. If it’s something you really want to do, you will always find the time! The most important thing to remember is to HAVE FUN!!! My name is Russell and until six months ago I had never contemplated running. I did have a physically strenuous job and I enjoyed recreational resistance training but it wasn’t until a friend of mine (who is a great runner) invited me to come along to the Mackay Road Runners off-season social runs that I found running to have such health giving benefits (as well as exploiting just how functionally and aerobically unfit I actually was)! The social runs were 5klm long and a good ‘no pressure ‘ way of making a start into running and to meet new people at the same time. The Mackay Road Runners Club members were immediately so welcoming and supportive and upon completion of a few runs over the first few weeks I felt a new release of energy throughout my week, particularly mental energy! This first year my goal is to keep enjoying running, get efficient at 10klm, and to stay injury free. As a Remedial Soft Tissue Therapist I have an interest in the injuries that runners are susceptible to and it’s a great way for me to implement injury prevention through soft tissue therapy. I love working on the human body and appreciate the opportunity to learn from seasoned runners. Since I ‘ve started running I’ve learnt a couple of things that hinder an enjoyable run for me, one being not to eat too much or too near a run and to keep well hydrated to handle climate conditions. Well three really, a good warm up makes for a nice run too! With all things going well I might consider a half marathon in June but at this stage I’m happy to be just enjoying running with a great group of people this first year. 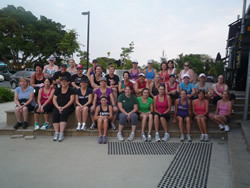 If you are thinking of trying running I can tell you to do it with Mackay Road Runners… it just feels bloody good! “My own experience is that as a junior I competed both nationally and internationally in events from 1500m to cross country. I also enjoyed playing Gaelic football (Shane is Irish) as a teen too, but fell away from the sport of running for five years in my early twenties. After putting on a considerable amount of weight, I decided that I had to make a change and completely overhaul my lifestyle …. the only way I knew how to do this was to start running again. My main goal this year is to establish a strong running culture within Holy Spirit College (HSC) where I teach and hopefully, change a few students’ lives and attitudes. I hope to be as competitive as possible in the Mackay Marina Run Half Marathon as well as trying to lower my 10km PB and get close to breaking 15mins for 5km by the end of the year. My favourite event is the 5 and 10km road runs, but due to a lack of competitive races in these distances compared to Brisbane, I have decided to move up to the half marathon and test myself to see what I am capable of. Shane recommends starting easy and increase your kilometres by only 10% each week to avoid injury and burn out. Every four weeks, have an easy week and ease back so that the body can recover. Also do not run easy all the time ie test yourself over 30 seconds and 2 minutes intervals with jog/walk recovery. Keep your eye on the goal…always record your training in a diary, great to see your improvements ie awesome motivator to hopefully see your times getting faster. Shane’s nutritional tip is to make sure you eat something healthy eg a banana before a long run whilst always making sure you are adequately hydrated throughout the day. Warming up and down always helps to avoid injury. Shane’s role as a teacher gives him great training options, AM or PM…..before work, there is less traffic and it gives him a good start to the day so he can relax with his wife in the afternoons or catch up on extra school work. The run groups at HSC also helps to keep him motivated as group training benefits him a lot as well! Natasja is a very keen cyclist with her most memorable events – the Argus ride (105km) in Cape Town, South Africa from 1995 to 1998, including winning the event in 1997 on a tandem, 160km Lake Taupo (NZ), Townsville to Ayr (265km over 2 days), Townsville to Cairns (360km over 3 days) and the Mackay River to Reef every year since 2011. She has also done some paddling and mountain biking in NZ, loves climbing mountains including her favourites – Mt Kilimanjaro (2001) and Annapurna Circuit in Nepal. To improve her fitness goals, Natasja advises training with people who are faster and stronger than yourself (and there are heaps in Mackay), remember “each step is one step closer to the finish line, keep on keeping on, you are not going to die (yet)!” She also has learnt to drop the bad habit of excuses and finds for herself, it is best to eat as much as you can and as often as you can! Natasja’s job as a Senior Lecturer in Accounting at the CQ Uni (Mackay Campus) keeps her very busy, so she does all her training early in the morning, ie up at 4.30am to feed the dog, have a BIG brekkie, run/cycle by 5.30am. 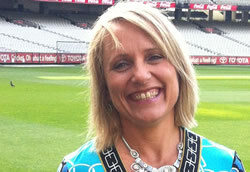 “I’m really looking forward to doing this year’s Mackay Marina Half Marathon and Gold Coast Half Marathon (July)”. Matt’s 28 years of Aussie Rules certainly was a great base for running, even though he didn’t know it at the time. In primary school, he used to challenge himself on how many laps of the oval he could do during lunch. Secondary school was all about cross country and at University, he did 10km efforts, whilst his (now) wife rode her bike beside him. At the tender age of 36, Matt retired from football due to injury, although not wanting to be idle, he then took up Triathlon which included running with Mackay Road Runners (MRR) on Saturday mornings. His current goals are to reach 10,000 klms of running since joining the MRR in 2007 which he’s on target to achieve by this December and complete 10 marathons. He’s already completed six and will be doing his 7th in Queenstown NZ in November. Two years ago Matt completed the full distance Cairns Ironman event where he swam (3.8km), cycled (180km) and ran (42.2km). He has also completed 10 Olympic distance and 4 half ironman triathlon events. More recently, Matt successfully completed his 2nd Six Foot Track 45km Ultra Marathon in the Blue Mountains, NSW. Matt has always loved sport and with movements throughout Queensland, played representative football for every league in North Queensland and represented Queensland Country in his younger days. His most memorable event was playing a representative game for Mount Isa in Tenant creek. They lost the tough match, but later found out that 15 of Tenant Creek’s team were in AFL training squads. Matt’s current weekly training generally consists of 6 days with three running sessions and the rest split between swimming and cycling. He highly recommends good running shoes, enjoy your achievements/improvements and keep a good balance between family and sporting life. Understand that when you are having a bad day, back off and reset for another day. Matt’s quick nutritional tip is to stay clear of energy drinks with too much sugar. Matt’s office job makes it tough to get training done, but finds early morning sessions work best for him and his family. Matt is a very talented athlete and an excellent role model, whether at work, with his mates, family, sporting clubs or community events. 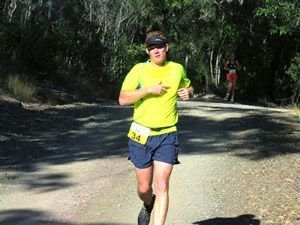 He is the main driving force of the Mackay Road Runners Eungella Half Marathon Trail Run held in April. Matt loves the half marathon distance and is looking forward to the Mackay Marina Run Half Marathon…..good luck Matt! Mel has been running on and off for nearly four years, but has become really focused in the last couple of years. She really enjoyed athletics at primary school, getting age champion in grade 6 and 7 and usually did well at inter-school meets, but never got further than that. She has always wanted to remain active and fit, hated being inactive and lethargic all the time, so finally decided to make a lifestyle change. After stopping and starting a few times with her running, she finally became a bit more dedicated towards some definite goals. This year, she is aiming to finish her first Half Marathon, training towards the Burdekin Sugar Rush Half Marathon in April & Marina Run Half Marathon in June. In addition to this she’s hoping to improve her personal bests for 5k & 10k along the way. She runs four times a week, including a long slow run, interval training, a hill or tempo run and the weekend Mackay Road Runners events. Mel’s advice to herself and other newbies is that you have nothing to lose by giving it a go, in fact most people are surprised by what they can achieve once they do give it a go. It really helps to have someone who can motivate you, whether it’s a running partner or a running group of like-minded people like the road runners, which has been the best motivation for her. She loves the friendliness of the Club where you can approach each club run competitively or just for fun, whatever you like. When she first started running, she would run her hardest every time, until she found that different runs require different intensity to improve fitness & times. Finding a suitable training plan was the best thing, as well as understanding that gradually increasing intensity and distances was the best way to avoid injury. She has always tried to eat healthily, but has been more vigilant since she has been running by mostly eating whole foods with a good balance of carbs, protein, fruit/veg and staying away from heavily processed food. As time has gone on, she finds she doesn’t crave the bad foods anymore. As a full time Administration Manager, it’s a juggling act with work and two young kids, especially when they don’t want to be left behind! Her understanding partner, Al, also works long hours but is very supportive and makes a huge effort to look after the kids when required…..overall, she has to be super organised to fit everything in. Three years ago, my work unit decided to participate in the 5K corporate run in the Mackay Marina Run. We called ourselves Team Awesome! When we first started training, I could only run a few hundred meters without stopping but over the weeks I got fitter and I managed to finish the 5K on the day. Not only was I happy about making the 5K but I realised that I had really enjoyed training for it and now when it was over I wanted to keep running. In the bag we were handed as part of our registration was a flyer about the Mackay Road Runners club. A few weeks later I found the courage to attend one of their Sunday runs and I have never looked back. Through the running group I’ve made lots of great friends and running is now an important part of my life. I try to run three to four times a week and I have never been fitter and healthier. I also fit in a Pilates session every week to help build my core strength. Being part of a running group is great as you can learn so much from other runners. They also support you in achieving your goals and push you along when the motivation is not there. Running with friends is great fun! Since that first 5K run, I’ve now finished several half marathons and last year I ran the Gold Coast Marathon. I’m not fast but I finished it and I’m so proud of myself. I will never forget the feeling when I crossed that finishing line! My next challenge is to run the Stockholm Marathon in May. It will be very special as the Marathon is held on my 50th birthday! 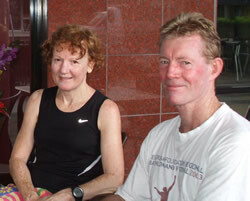 Alana & Peter Ford are very keen sporting enthusiasts, both loving to run since their Primary School Cross Country days. Their Dad, Jim, who is a very talented runner, got the kids interested in running when he was heavily involved in running distance events up to the Marathon. Peter has always preferred League and Union football, but still maintains a high degree of running ability. Currently, Peter, who confesses to being a bit out of condition, has recently been finding a lot of motivation whilst training with his sister. He is also building up his fitness, strength and muscle for his upcoming footy season, so even though he loves to run, he wants to keep a good balance so as not to drop too much weight. Alana loves to run as well, but found it difficult to train with a Club when working in Brisbane but now she is in Mackay, she finds the running environment here a lot more flexible. She is a very consistent and disciplined athlete, much to Peter’s angst, however, he is finding huge improvement and benefits from running with her and the Mackay Road Runners Club. They both enjoy Touch Footy, which requires running speed and endurance, thus helping with their all-round fitness. Alana being a Dietician understands the sports nutrition and recovery side of getting the most out of your body, whilst, Peter, being a Pharmacist is a believer in sensible supplementation. However, with Alana’s expertise, Peter is finding a good diet can drive overall weight loss and fitness gain, although he still likes his powder supplements. Alana is aiming for a sub 90 minute Half Marathon at the Mackay Marina Run, as well as slotting in another couple of other half marathons later in the year. Peter is more a 10km runner, so we will see him sprinting the 8km Mackay Marina run, however, if the training is going well, he could be racing Alana in the Half Marathon! With all the training Peter and Alana are doing, no doubt the local Physio’s and sports shops will be cashed up, not to mention the thousands of other excited runners chasing their goals at The BMA Mackay Marina Run. Karen has come a long way in a very short time… and that includes running a long way too! She used to be a sprinter in her younger school years and had never really run until the last couple of years, when she completed her first 10km in 2012. She had always been fairly active but after breaking her ankle playing netball, she started walking, then progressed to running to retain her fitness. Even though she was a long time netballer, she thought this might be the time to swap the netball shoes for running shoes. She joined the Layzee Runners Group as it accommodates for varying fitness levels and has since completed her first half marathon at the Mackay Marina Run in 2013. One month later she ran the Gold Coast Half Marathon, then challenged herself two months later by completing the Great Whitsunday Walk 28km trail run. That was the most challenging run by far, but her first half marathon at the Mackay Marina Run was very special – she never thought she would ever run 21km! 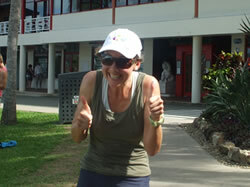 Karen is now only in her third year of running and has been a Mackay Road Runners Club member for two years. She credits the club for helping her achieve her goals, as they have group social training sessions on Tuesday, Thursday, Saturday and the club run on Sunday. Whilst she had never considered herself overweight or unfit, she was astounded at how much her fitness had improved since she started running. She said the best thing she ever did was give up smoking in 2006 and without realising it, lost nearly 20kg and has never been fitter. She has this year set her sights on once again doing the BMA Mackay Marina Half Marathon and has just registered for her first Marathon attempt at the Gold Coast in July. Karen is hoping with the support of family, friends and running buddies to get through the training needed for the arduous event without injury and in one piece! She loves being out in the open and running allows that. Her goal is to enjoy her running, and even though balancing family, training and work can be a challenge, she remains committed with consistent training. Rain, hail or shine, she has learnt to commit to her training plan so that she can achieve her goals. Karen also realises that taking recovery breaks is equally as important, so whilst she endeavours to maintain good nutrition, she will allocate one day off running to reward herself with whatever food she wants – chocolate!!!! Karen rates running as great for everyone ….slow/fast…long/short distances…..young/old….etc…. she encourages everyone to just give it a go! If things get a bit tough, think of some inspiring moments from others, tell yourself regularly that even if it hurts, you CAN do it, the final sense of achievement when you finish will far outweigh the pain; try different running locations, cross training, credit yourself on all the previous training you have done and what you are looking forward to at the end……maybe…..CHOCOLATE!!!! Karen is to be congratulated on her running successes…she has achieved so much more than she ever thought she could and has been deservedly rewarded by her patience and persistence. As a much valued member of the Mackay Road Runners Club, her open, positive and humble personality is highly regarded by her peers. 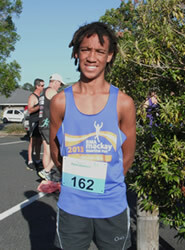 Nineteen year old Samat Widdup is looking forward to competing in the BMA Mackay Marina Run’s DBCT (Dally Bay) 8km run. Whilst Samat loves to run, he has only been running on and off for a few years, but he has come back with full force this year in preparation for a fast time in the 8km event. Samat is a quiet achiever who loves to run the hills at Mt Pleasant, which he finds tough, but gives him intense strength conditioning as well as an extreme cardio workout. He loves to run with his Grandpa, Michael, who was also pretty impressive at a recent off season Mackay Road Runners event. Samat does very well to balance his day job with his running by training most afternoons, including some cross training activities. Samat’s quiet nature masks a very competitive athlete, who is able to focus when things get tough, especially in the longer distance events which he enjoys. Mackay Road Runners support and congratulate Samat in his endeavours to be the best he can be……we look forward to seeing him achieve his goal on race day on 1st June. Marilyn (aka Dr Bennett) has always been keen to keep fit by varying her training activities. She gets disappointed with herself if she gets slack and unmotivated, however by mixing up her training, she has found this definitely helps her overall physical and mental fitness on the sporting field as well as throughout her extremely busy working day. She started running only a couple of years ago with the Layzee Runners Club. She found this a great way to start as they taught her to pace herself by starting with a short run, then short walk, slowly building up to running 5km non-stop. She already exercised at City Fitness Gym in the mornings, played and trained for hockey and after seeing a notice about the Layzee Runners at the Gym, thought this would definitely add positive benefits to her stamina whilst playing hockey. She was right! Layzee Runners conduct their sessions Tuesday, Thursday and Saturday mornings, so the very encouraging, supportive, no pressure, social style workout fitted perfectly into her schedule. She also enjoys boot camp style classes, especially the Tribe Fit classes at City Fitness, which can be very intense and challenging….definitely feels like she has done a tough workout afterwards! Marilyn has since progressed to run out of town events, including the Bridge to Brisbane 10km and the tough Sydney City to Surf 14km. She found the gathering of so many like-minded people very exciting and invigorating. The crowds, including runners, supporters and volunteers kept her going, plus with the added entertainment along the course, she found this an enormous boost, especially when you hit a tough spot. Whilst Marilyn loves to get the best out of her running, she frequently joins up with a friend for a social jog, plays squash with her son or brother, cycles and walks her dogs on the weekends with her partner, Noel, with the added bonus of Noel shouting a coffee on the way home…..a great way to start the day! Marilyn’s advice for someone starting out is to join a group like Layzee Runners….low cost, start slowly, run/walk intervals, no pressure, encouraging, etc…..
Whilst running, Marilyn looks for little goals to keep her mind positive, eg the next power pole, tree, sign on a building….”it’s amazing how you can keep going”. She will not stop unless absolutely necessary, as she finds it harder to get going again, so she would rather go a little slower until she catches her breath……”the more often you run, the more you can run”. Marilyn is also a great motivator to her workmates, family and friends…..she is always encouraging them to join in charity fundraisers, fun runs, boot camps, etc…..
After tearing her left leg muscle prior to last year’s Mackay Marina Run, Marilyn was forced to pull out of the 8km event along with other sports & exercise. She was very disappointed (and most likely very hard to live with! ), as she had trained so well in the lead up, however, having already done the 5km Marina Run previously, she is now very keen to nominate once again for the 8km Mackay Marina Run this year. Good luck Marilyn…you can do it!!! The BMA Mackay Marina Run could not exist without its many valued volunteers, including Trevor Townsend from the Mackay West Rotary Club. Trevor, who is originally from Brisbane, has lived in Mackay for the last forty years with his lovely wife Pauline, kids and grandkids…..so I guess, you could say he is definitely a local! Helping the community is a big thing for Trevor, so together with several other volunteers from the Mackay West Rotary Club, Trevor has volunteered for the BMA Mackay Marina Run in many ways over the last four years. He has been on the road manning water aid stations, marshalling and directing runners, and then backing up to cook up a storm on the Mackay West Rotary Club’s BBQ for the hungry hoard of runners and supporters at the finish line. Although YOUNG Trevor claims he couldn’t run to save himself, he loves to be involved in supporting the Marina Run event in any way he can via the Mackay West Rotary Club. Their club raises much needed funds through the BBQ sales to assist the local community in many special volunteer projects, such as supplying fencing, concreting to homes for the handicapped and the elderly, endeavouring to make life a little easier for them. Whatever money is raised by their club, goes straight back into the local community, including supporting and donating money to the Men’s Shed at the Iona West Mackay Church grounds in Brooks Street, West Mackay. Trevor’s previous sporting attributes include football and water skiing, however, due to a series of injuries, Trevor believes he will not be running any of the events in the near future at the Marina Run. But, you will definitely see him on the road volunteering or at the Mackay West Rotary BBQ….so pay him a visit on 1st June and get some yummy breakfast to refuel after you run or whilst you support your family and friends. Many thanks to Trevor and his dedicated crew……see you at the finish line! 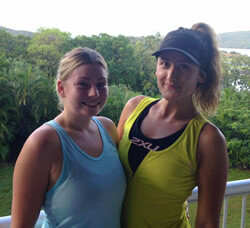 A small contingent of athletes from Hamilton Island are gearing up for the Mackay Marina Run on 1st June, including very keen runners, Tash Partridge (left) and Maja Zepcan. Tash, originally from Norfolk Island and Maja from Melbourne, live and train on Hamilton Island, where they both work in the Island’s Day Spa …. lucky girls! Tash and Maja are very different in their athletic experiences, whereby Maja is a very seasoned runner having done several half marathons including Melbourne, Townsville and Ayr as well as half ironman events, Tash is a complete novice attempting her first ever half marathon at this year’s Mackay Marina Run. challenging, but excellent for the stamina and strength required for half marathon events. Under the guidance of an experienced and talented athlete in Hamilton Island’s Activities and Events Manager, Stephen Jackson, the girls train in a group environment, with goal events in place such as the Stamford Financial Hamilton Island Hilly Half Marathon on 4th May, the BMA Mackay Marina Run (1st June) and the Gold Coast half marathon (6th July). Both girls, who started training in earnest a few weeks ago, have been building up their kilometres and attending various cross training sessions in sensibly managed stages, so as not to incur an injury, with Steve and all the runners in their group. Everyone is at differing levels, but all inspire and motivate each other, especially Tash, who has never run before. The training is going very well for Maja and Tash, but they have been finding the weather a bit ‘character building’ of late with the humidity and subsequent rain …. yes, it does rain on beautiful Hamilton Island, but continue to encourage each other when things get tough. Good luck girls, we know you will achieve your goals! Andrew has always enjoyed sport in one form or another, whether it was at school competing very successfully in the 1500 metres and various cross country events or playing Rugby Union. Whilst living is Queenstown, New Zealand, there was never a shortage of places to run, so keeping fit was always an enjoyable pastime. With a very busy family and work lifestyle, Andrew then drifted away from running for a few years, however, in 2012 a friend challenged him to compete in a 10 km run in Townsville, and after that he realised how much he had missed it. He subsequently joined the Mackay Road Runners that week, with his first event being a none too easy 14km hilly Eimeo Pacific Hotel run. 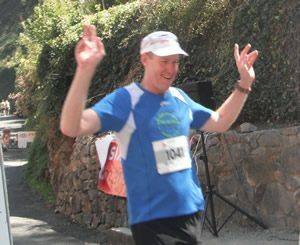 Andrew tends to enjoy the challenges of the tougher runs and looks forward to various runs such as the Eungella 21km trail run, Hamilton Island Hilly Half Marathon, Whitsunday Great Walk 28k and the Eungella King of the Mountain. The BMA Mackay Marina Half Marathon and the Gold Coast Marathon are two events in particular that he has targeted this year, as well as competing in Queenstown’s (NZ) first official Marathon in November. Andrew likes to do 2 x 10km and 1 x 16km run per week, but is finding doing 2 x 12kms a day suits him best. Prior to the 2013 Mackay Marina Half Marathon, he followed a 12 week training program, which he found helpful as it suits all types of runners and gave him a great base to work with. He finds the mental side of running just as important as the physical, due to the fact that when you experience a few aches and pains throughout a race, the mental challenge of concentrating to overcome such obstacles can be draining. He tries to concentrate on his breathing and posture when things get tough and also breaking up the run within the run with shorter goals, such as concentrating on the next 500 metres, then the next, etc…. However, all in all, Andrew just loves to run whether it’s fast or slow, long or short, it is very rewarding! Andrew is also an integral part of the Mackay Road Runners Club, humbly volunteering at all the weekly events that he attends, unselfishly supporting other runners, willingly offering his time, etc……..the Club is so appreciative of his efforts and very congenial personality. 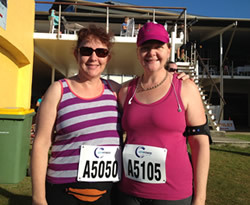 Sandra Henderson (pictured left) is one tough lady…..she only started running in March 2013 whilst waiting for her husband Simon and son Tom who were doing a Mackay Road Runners Club 5km run. She was already walking 2 to 3 times a week with her good friend of seven years, Kim Summers, when Kim started talking about running and suggested they do the 5km run at the Mackay Marina Run. 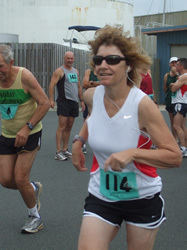 After taking her son Tom to a Mackay Road Runners 5km run one Sunday afternoon at the Marina Breakwater, Sandra started jogging with short walk breaks. She then downloaded a ‘how to run 5km’ app and progressed from there….in no time at all she was running 5km without walk breaks! Sandra’s initial goal was to run 5km and with that goal achieved, she has now set her sights on completing at least 3 half marathons this year. She is enjoying her running enormously and reaping health benefits that have come with it. In her school days, she played volleyball and netball, but for the past 20 years, has not participated in any regular sport except walking with her friend. 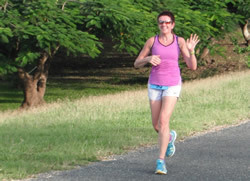 She now runs 3 to 4 times per week, incorporating 2 x 3km-5km runs at her best pace, then adds a long run, approx 18km, on Saturdays, as well as running the Mackay Road Runners’ events on Sundays. Sandra’s suggests for beginners, like she was, choose a time/friend/training program that sounds like something you can do and go for it. Buy good shoes and measure success with a watch or phone app. Having a simple goal, eg Mackay Marina Run/joining Mackay Road Runners Club or the like, whatever makes you comfortable, is a great way to keep motivated. Sandra found her friend Kim, who unfortunately has moved away from Mackay before they achieved their first goal, was an excellent source of support, as Sandra was for her. However, as good friends do, they kept in touch via text messages, Facebook and occasional phone calls to compare their competitive strategies, training and event tips. Sandra finds when things get tough, she phones a friend or joins in a group run, but understands that some days you need a day off to reassess how you’re feeling, mentally and physically. When Sandra sets her goals, she sometimes keeps a few challenging ones up her sleeve in case she is going really well. Sandra recommends the running ‘high’ for overall body and brain function and even though she gets tired at times, she knows it’s so worth the effort! Mackay Road Runners congratulates Sandra on her personal achievements…she looks and feels awesome and can’t wait for the 2014 Mackay Marina Run! Jay is famous for his early morning breakfast radio show with Dave on Sea FM, where he starts your day with his jovial banter and community minded charitable spirit. Jay was a bit shy to allow a runner profile on him, but with his good friend Chev convincing him, we finally got him talking (just a little). Whilst previously weighing in at a not very healthy 120kgs, Jay was keen to reinvent himself towards a fitter and healthier person. Jay now weighs in at under 100kgs, but is looking to decrease it even further so that he can continue to enjoy his enhanced very busy lifestyle. 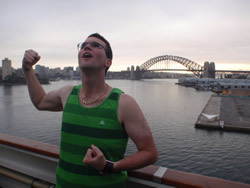 Jay enjoys jogging on the treadmill and training for specific goals such as the Mackay Marina Run, where he is keen to compete once again in the 5km. He has taken part in various Fun Runs for many reasons, but what he likes most is pushing his own boundaries and testing himself both physically and mentally. He really enjoys the atmosphere of the Mackay Marina Run – “it is a great day and there is heaps of support and encouragement from other runners… it is not about winning, but giving it your very best”. Jay uses events such as the Mackay Marina run to motivate himself to set and achieve his running goals, which transpires into greater personal confidence and motivation to achieve other life goals that would not have been possible before. 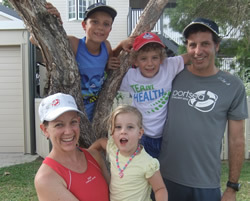 The very active Ward Family love to run and the Mackay Marina Run is one of the highlights on their running calendar! So much so, they will lace up the running shoes in Mackay for the last time early Sunday morning, 3rd June at the Mackay Marina Run, before moving to Canada for two (2) years. Once Chris competes in the half marathon, Jacqui in the 8km, Harry (5km), Patrick (3km) and with Alice running rings around them all between events, they will drive off into the sunset (Melbourne) that very afternoon! The Mackay Marina Run is a perfectly placed event for the family, as they head to Noosa before the Marina Run for a bit of secret training, where Chris will run the Half Marathon and Jacqui will tackle her first ever 10km race. The action doesn’t stop there…….next stop New Zealand, to catch up with family, then Los Angeles before settling in Canada where Chris will continue his medical work. Chris has nominated for the San Francisco Marathon late July and no doubt there will be an event for Jacqui, Harry, Patrick and Alice. Chris is hoping to up the training in America so that he can clock a personal best time in the Marathon. The family are looking forward to being very actively involved in running while they are in Canada, with Chris very excited to be training and racing in zero humidity for a change! Their running fitness will certainly help other international sporting challenges, including ice hockey, snow boarding/skiing, basketball and soccer. The family, who have been in Mackay for three and a half years, will miss the camaraderie of the Mackay Road Runners, where Chris was introduced to the club via a work buddy. Jacqui has been running on and off for approximately five years, and the kids haven’t stopped running since they could walk, so look out Canada, here they come! Best Wishes to the Ward Family for lots of happy and safe adventures. 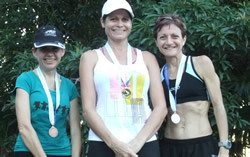 Lisa (pictured centre) was coerced by a workmate into her first 5km run at the start of the 2008 season with Mackay Road Runners. Since then, Lisa has progressed to running half marathons (21.1k) where in the last couple of years she has stepped up the training to now be seen as a regular podium finisher. With the help of Weight Watchers and the encouragement of Mackay Road Runners, Lisa has lost 18.5kg, feels heaps fitter and stronger and her running has improved out of sight. She was so impressed by watching other runners getting out there having a go, no matter what age or ability. In fact, one of Lisa major goals in the 2009/2010 seasons was to set herself a benchmark in catching a very talented veteran runner, Stuart Sprott. Lisa credits her many friends at Road Runners for her continued enjoyment of running with the friendly support they give before and after the weekly events. 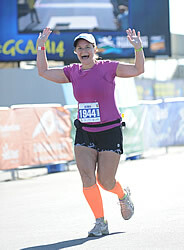 Lisa loves the atmosphere of the Mackay Marina Run, “Everyone is so happy to just run their own race”. She is looking forward to her third Mackay Marina Half Marathon this year and is hoping to better her time from last year (1hr 54 min). Lisa’s current training consists of running 21km on a Saturday morning, doing the Sunday Club run, gym pump class with weights and a 10km midweek run. Keeping her core muscles strong, together with a balanced diet has also assisted her running. Lisa has set herself several goals, including bettering her 2011 Eungella King of the Mountain time. 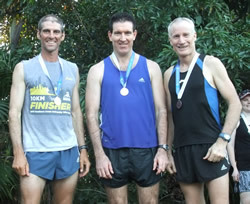 Newcomer to the local running scene, David Bellamy (pictured left) grew up in northern Sydney alongside the Kuring-gai Chase National Park, where he enjoyed the majority of his early running experiences. Starting out as young as eight years old, he tried little athletics and also played soccer (football for those purists), cricket and tennis. He usually got to regional level in school athletics representation, although once out of school, he started doing duathlons and fun runs with some mates, thus combining something he loves and raising money for a good cause. David has competed in fun runs from 4km to 21km all over Sydney, and entered his first triathlon in 1999, the Foster Half Ironman. Since moving from New South Wales over ten years ago, his fitness was a bit spasmodic; however he still managed to compete in the Gold Coast Marathon 10km and the Bridge to Brisbane 12km. His favourite event in recent years would have to be The Endeavour 500 Challenge, a team relay run over 3 days. The run goes through towns such as Beaudesert, Boonah, Warwick, Toowoomba and Fernvale. 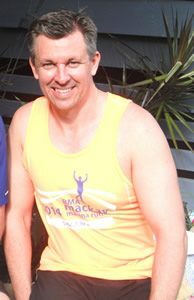 David’s current goal of running a km for every year of his age (42) has him looking forward to the BMA Mackay Marina Run Half Marathon event as a great lead up to his first ever Marathon, the Gold Coast Marathon 42.2km in July. David moved to Mackay in August 2011 and started running with Mackay Road Runners, the first running club he’s joined, and finds them a great bunch of people. He’s beginning to get some of his old spark & speed back from chasing some of the top class runners at the club such as current club Champion Shawn Claydon and young rising talent, Liam Mumford. Thanks to these gents he hopes to edge closer to his personal best times from 20yrs ago:- 21km(82min), 10km(32:30min), 5km (16:10min). Mackay Road Runners would like to thank David for generously sharing his vast running knowledge, especially when he leads the weekly social group training sessions. Good luck on your goals, David! 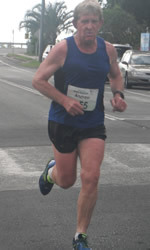 Moranbah runner, Gary Jenkinson loves running, so much so, that he has competed in over twenty five marathons, including a 50km ultra marathon in Canberra and more recently (Feb this year), the Launceston (TAS) 50km. He ran the Mt Kosciusko Marathon a few years ago, which he said at the time, was the toughest thing he has ever done. Jenkinson, who has been running marathons since 2000, will be competing in the BMA Mackay Marina Half Marathon in the lead up to his next marathon challenge, which is in Alaska on the 28th June. Gary is a keen supporter of the Mackay Road Runners and regularly runs with the Club whenever his work commitments allow. Mackay local, Joe Finato has always been interested in working hard and keeping fit. Joe, his wife Dee and children, Holy Spirit students, Cameron and Julia often train together and with other family members. Dee’s Dad, Lew Cameron was a long time Mackay Road Runner, who now spends his time travelling around Australia. In the meantime, Joe has been training with his fifteen year old son Cameron in the lead up to the BMA Mackay Marina Run, where Joe is hoping to break 1hr 30min in the half marathon, bettering his last year’s time at the same event. With Cameron’s fitness and determination he has a tough running partner in Joe, but is looking on track to place favourably in his chosen event, the 8km. Needless to say, Dee and Julia are a pair of pretty focussed competitors too, with Dee challenging herself in the 8km, whilst thirteen year old Julia will be gathering some of her friends to have fun in the 5km. In addition to their BMA Mackay Marina Run events, Cameron and Julia will also be benefiting from this training when they compete in their respective secondary school cross country events in the coming weeks. They both recently had success at the Mackay Road Runners Athletics North Qld Cross Country races on 1st April, where Cameron scored a gold medal in his 4km race. Best of luck to Joe, Dee, Cameron & Julia, who will be among over fifteen hundred competitors across all events at the BMA Mackay Marina Run when they line up to achieve their goals on Sunday, 3rd June. The Lazy Runners are an awesome group of runners/walkers who vary in ages and abilities. Individual groups are organised for those who wish to start right from scratch by walking and then slowly progressing to running if they so choose, with no pressure or competition for placings or times. There are currently 93 runners/walkers registered as from 1st January this year. The run/walk program at the moment is for 5kms, where they are gradually introduced with a program that takes 12 weeks with a graduation breakfast at the end of that time. Saturday training time is 5.45am from Metro, Tues and Thurs at 5.30am from City Fitness. The next new group will start 31 March but this group will have their training shortened to fit in with the BMA Mackay Marina Run. Linda was at her heaviest weight of over 100kgs and feeling down, with not a lot of energy at all. Her husband, Mark would always go to the Mackay Road Runners Sunday runs where she would be home or sitting in the car wishing she could at least jog a little. In 2010, she saw a promotion on the Lazy Runners club, where she thought she would give it a go. Just learning to run 5k’s without stopping was a huge challenge for her “Gosh I thought I was going to keel over and stop breathing!” But that didn’t stop her; she didn’t give up and started to notice her weight was slowly coming off at a nice pace. 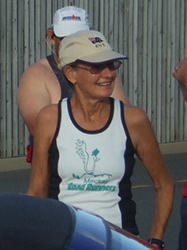 She entered her first 5k run at the Mackay Marina Run in 2010. “Well, what an emotional day that was, crossing that line not caring what time I did it in. It was the best feeling ever!” Since then she has competed in the Townsville Running Festival, Gold Coast Marathon, Hilly Half Marathon, and the Mackay Marina Run in 5k, 8k, 10k & 21k runs. She always said she would never to do over 5kms, but that didn’t last long, as she sought higher goals for herself. 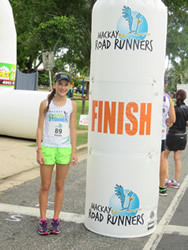 With great support from husband, Mark, he encouraged her to come along to a Sunday run with the Mackay Road Runners. She was so nervous, but found the people in the club to be very welcoming and encouraging. “What a great bunch of people I have come to know and become great friends with. Now Mark & I have a great passion about the sport we both love. It’s ME buying all the running clothes now!! !” Congratulations to a fab, fit forty year old, who has maintained her healthy weight since she began her fitness regime. Local Mackay road runner and Race Director of the BMA Mackay Marina Run, Sandy Strong is heading away for the trip of a lifetime – to compete in the 116th Boston Marathon on 16th April! In the midst of his very busy schedule organising the BMA Mackay Marina Run, Sandy managed to qualify for the prestigious event by running under the required qualifying time at the Sydney Marathon last September only hours prior to the Boston cut off. He has suffered several injury setbacks in the lead up to Boston, but has always managed to keep a positive attitude throughout. Although running is his favourite activity, Sandy also cycles to vary his training which he finds is also a perfect alternative to running whilst injured. Sandy will be back from Boston just in time for the BMA Mackay Marina Run, although at this stage he will not be running in the race, but crazily running around ensuring the event runs smoothly. Martin Lambert is in full training for his next goal, which is the Mackay Marina Half Marathon. Financial Planner and staunch Chelsea supporter, Martin does a long run training session every Saturday morning at 4.45am. He is now running up to 36km with a group of like minded individuals, in a bid to conquer the 42.2km Marathon events on the Gold Coast, Sydney and Melbourne later in the year. His wife, Kelly and children, Charlotte and Genevieve are talented hockey players, but have added running to their fitness regime this year, mainly to gain an understanding of Martin’s running obsession and maybe to see a bit more of him. They are getting as hooked as he is and have now decided to take up the challenge of the 5km Fun Run at the Mackay Marina Run. 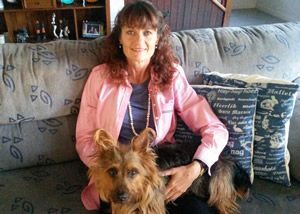 Retired Mackay West State Primary School Librarian, Heather Sprott does not know how she found the time to work, now that she has retired. This amazing lady leads a very full life including many interests such as painting, drawing, singing, acting, travelling, catching up with friends and now, running! After a major cancer scare several years ago, Heather, who is now in remission, will be entering the 5km run/walk event at the Mackay Marina Run, where several thousands of dollars raised from donations, functions and sponsorships will go to the local branch of the Leukaemia Foundation. Her husband, Stuart has been running just about his whole life, so she has an expert in the house whenever she needs some motivational training tips. Heather is a very inspirational person, who has wonderful support from her family and friends in whatever she sets out to achieve. Heather is looking forward to her first ever 5km event – look out Stuart, she will be catching you soon. Rosemary and Duncan Townsend are a very busy, sporting couple who are heavily involved in playing, coaching and organizing sporting activities including touch football, rugby league, running…and that’s in between running their own family business, Townsend Cabinetmakers in Walkerston. They have competed successfully in a high level of representative honours in various sports for Mackay and Queensland since a very young age and continue to perform very well in their chosen activities. They include their five sons in their very active lifestyle, which the boys love, as like most brothers, they are a very competitive lot! The family is looking forward to competing in the Mackay Marina Run, where Duncan will take on the Half Marathon event, while the younger boys will compete in the shorter distance races. 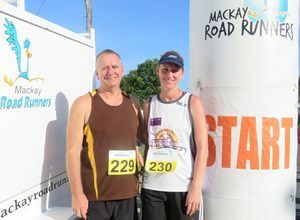 Even though the family live out of town, they endeavour to get to as many Mackay Road Runners races as possible on the weekends as well as midweek. Their eldest son, Jake, who was absent from this photo, will be very competitive in his secondary school 8km cross country event, as will younger brothers, Matt and Ben, who frequently place prominently on the medal podium. With all this talent in one family, there’s bound to be a competitive sprint to the finish line come race day at the Mackay Marina Run – good luck to everyone! Jeanette Farrugia is a very dynamic person who loves exercising and getting as much as she can out of herself in whatever she attempts. Her major sporting interests include running, swimming, cycling, yoga and anything else she can fit it. 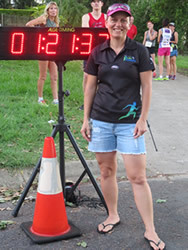 Since Jeanette joined Mackay Road Runners approx 5 years ago, she has competed at a very high level, collecting many podium placings, including taking out the Club’s female Club Championship Trophy in that time. She currently volunteers her time to assist the Club whenever she can by marking the weekly race courses and seeking sponsorship prizes for the Club’s major events. Another one of Jeanette’s amazing achievements was personally raising over $11,000 for the Leukaemia Foundation for last year’s Mackay Marina Run, in addition to the time-consuming role of walking the town collecting donations for random draw prizes for the 2010 event. 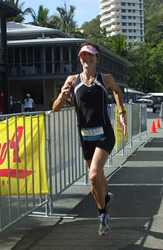 Jeanette recently competed in the Hamilton Island Hilly Half Marathon where she collected first prize in her age category. 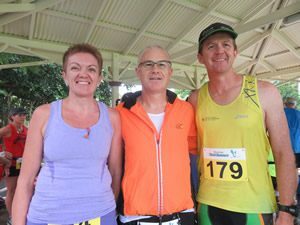 Jeanette’s main highlight was the camaraderie and atmosphere of the event, which was sensationally organised by the 2010 Mackay Marina Half Marathon winner, Hamilton Island’s Sports Club Manager, Steve Jackson. Jeanette is looking forward to the 2011 Mackay Marina Run Half Marathon where she will be one of the favourites to feature highly in the placings – Congratulations and good luck, Jeanette! 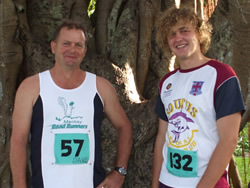 Father and Son runners, David & Steven Vincent are keen to join the ranks of over 1000 competitors at the Mackay Marina Run, where David will compete in the 21.1km Half Marathon event and Steven will tackle the eight kilometre race. The quiet achievers have been steadily increasing their training at the Mackay Road Runners weekend events, the Club’s social training group on Wednesday nights, as well as running and cycling in their own time. David (Father) was a very talented athlete in his school days, holding high school records in the 200, 400, 800 and 1500 metres events. He also played representative rugby league for Mackay in his teens, played club soccer and later turned to triathlons, where he could use his excellent running, cycling and swimming abilities to retain his fitness. His son Steven, a Year 12 Mackay High Student, easily filled his Dad’s shoes by also being a talented rugby league player (High School Rugby League Academy) and a top level swimmer. Steven recently came second in his 6km school cross country event, allowing him to step up to run in the Mackay & District cross country championships. Both runners are very supportive of each other and their fellow competitors, where they can be often seen encouraging other runners with good natured comments. Although, there doesn’t appear to be any major rivalry between them, two competitive athletes of their calibre would not let the other win easily. Go Steve….I mean Dave…. One of Nicky’s favourite runs was the 100k ultra marathon in Mongolia, followed closely by the Dili Marathon in east Timor last year. She has also done the Sydney marathon, and the Munster marathon (in her hometown of Germany), and next month (April) she will be competing in the Boston marathon. Her personal best time for a marathon was 3hr 35min at the Sydney marathon. The most beautiful half marathon she has experienced was the 2010 Hilly Half Marathon on Hamilton Island, where Nicky ran under 2hrs 30min over the very tough course. She has recently had a couple of injuries, so her current goal is to get through the Boston Marathon without further injury. In the future, she would like to run the Beirut Marathon, the Two Oceans in South Africa, and the Great Wall (China) marathon. Nicky’s main objective is not about the time she runs these events in, but more about the amazing atmosphere, experience and the people you meet. Several of these events are special project orientated, eg the Ultra Marathon in Mongolia raises money to fund waste management projects and protect the environment and its’ people, as well as funding glass houses for nomads so they can have a wider diet and grow veggies. Nicky’s fitness will certainly be peaking by the time the Mackay Marina Run comes around in June, as she will be targeting this as her next event upon her return home from the Boston Marathon. 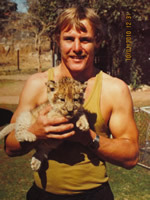 The photo to the right is of South African runner, George Elcombe in his heyday approx twenty years ago, where in South Africa from the age of thirteen, he trained lions, leopards, hyenas, otters, elephants, chimps and other wild animals for use in movies. As George grew older he continued his very active outdoors life with the animals as well as doing 15 months in the Army in S.A.S, playing Rugby for Zimbabwe in New Zealand at the World Cup in 1987. Unfortunately, in 1991 injury halted George’s thriving Rugby career, so he decided to keep fit and took up running approximately 15 years ago with the Harare Athletics Club in South Africa. His most memorable run was the Two Oceans in Cape Town, South Africa where he ran 56kms in 6 hours. He has been with the Mackay Road Runners and Step Into Life Fitness groups for the last three years and loves the camaraderie both Clubs offer. 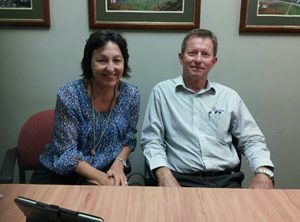 George enjoys running for his own personal achievements and is looking forward to the Mackay Marina Run where they offer great distance options from 3km to 21.1km. 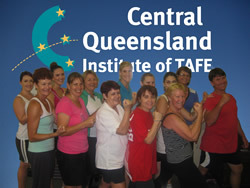 Several very motivated employees who work at Central QLD Institute of TAFE in the capacity of a teacher, administration or marketing staff are committed to doing regular circuit training, which is run by the fitness staff at the college and supported by City Fitness Health Club. They do circuit training in their little gym twice a week and have been doing this on a consistent basis for nearly a year now. They started off with only a couple of attendees and have now grown to a group of about 20, who come as often as their working commitments will allow. Everyone always says they do not have time to exercise, but this great little group are so motivated to achieving their goals, that they manipulate their lunch breaks or surrender it just to come along. Many have back, knee, shoulder and other health problems but it does not stop them from having a go. Everyone is stronger and fitter and more able to cope with the inevitable pressures of the job. They all work harder when there is a goal to achieve and theirs is to participate in the Mackay Marina 5km Fun Run. They may not be the fastest or the most athletic, but they will be there in force, looking forward to enjoying the satisfaction of attaining their respective goals in an inspiring environment of like minded individuals. The group’s ages vary from late teens to their 60’s, with some having battled with their weight and depression, even some have had quite serious car accidents, but all have that drive to want to feel better. Everyone gets on really well, they are very supportive and encouraging of each other and they certainly have been more committed since setting their fun run goal. The group says “Thanks for thinking of those who never want to run a marathon! ” ……but, you never know!!! Cameron Owens has had an amazing transformation – he is particularly proud of this photo, as he feels like he’s bigger than the Sydney Harbour Bridge! Back in October of 2009 he weighed 176.4kg and had a waist size of 142cm. Looking at how obesity was controlling his life, he decided to make the change and not look back. He now weighs 102.6kg – that’s 74kgs!!! His waist measurement now varies between 92 – 97cm and he now leads a healthy and active lifestyle. He is looking forward to kicking two things off his bucket list: 1. raising money for charity 2. competing in an event such as The Mackay Marina Run 8km. He aims to raise $1 per metre of pavement that he pounds out during the Mackay Marina Run, coming to a grand total of $8000 for the Leukaemia Foundation. At the moment, his personal best time for 5km is 27 minutes and 20 seconds, and you can often spot him most evenings at South’s Gym or churning up the sand, jogging up and down Far Beach. He had never been able to run before he lost his weight and cannot seem to give up the addiction. He reckons he can now breathe deeply, and his skin feels great when he works himself into a hard-core sweat. His family and friends are a great support to him and can’t wait to see him sweat it out. Go Cam, what a great achievement so far – you are a winner already! Legendary local roadrunner, Judy Zahn has been seen pounding the pavements, hills and beaches in Mackay and District for well over twenty years, collecting many trophies, medals and accolades for her top placing’s along the way. 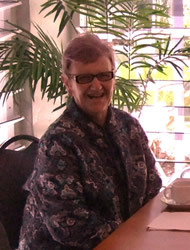 Judy’s natural running abilities stem from her younger days, where in 1968, she was a champion sprinter, with her 4 x 100 metre Queensland State Secondary School relay team racing against Raelene Boyle’s Victorian team. These days her favourite distances are closer to the half marathon (21.1km), but Judy still places highly in races from 1.6km (mile) to 30km, although when in Marathon (42.2km) training, Judy has had very successful outcomes. Judy is the most capped Eungella Queen of the Mountain, as well as being the reigning female Mackay Road Runners Club Champion, a trophy she has won several times. Her many highlights include: reading the Daily Mercury about local runners Wendy Shields and Carol Porter’s achievements inspiring her to tackle the longer distances; conquering her first ever 5km (many years ago) and last year’s Mackay Marina Run Half Marathon where she placed 4th overall female in a personal best time of 1hr 35min. Judy has always involved sport in her life, whether it be competing or holding down a committee role for Mackay Road Runners, Table Tennis, Softball, etc.. Judy’s eagerness to assist and her positive attitude is a great role model. Having just turned sixty years of age earlier this year, Judy is not slowing down anytime soon. Teresa & Graham Robinson have been involved with running and cycling in the local area for over twenty years. Both are keen on keeping fitness a priority in their life and have been known to rise at 4am to fit their training run or ride in before it gets too hot, or before they head off to work. Both their sons, Matthew & Andrew, are away at University now, so this gives them a little more time to devote to their favourite activities. Both have been heavily involved with Mackay Road Runners for many years, selflessly volunteering on the Committee and at the weekly events that the Club conducts. The easy going pair has a strong camaraderie with many local sporting groups, and love the friendships that have been forged over the years. They set a great example to other runners with their open friendliness, where they have been known to often be the last to leave Club running events. For many years, they have also hosted events from their residence, where Teresa puts on yummy post race treats and Graham sets a challenging course. They are both gearing up to compete in the Mackay Marina Run Half Marathon, just prior to going to one of their favourite events, the Gold Coast Marathon, held annually in July, where they have been competing for a number of years with several other local athletes. Talented junior runner, Liam Mumford will be looking forward to this year’s Mackay Marina Run after suffering a setback at last year’s event. Liam, who had been in blistering form leading into the race, broke his collarbone playing football less than 24 hours prior to contesting the 5km Fun Run. Liam, to his credit, pushed aside his disappointment to assist all the other 5km runners by volunteering on the water aid station. The then Year 9 student returned to training as soon, if not before, he was able, to easily regain any fitness he may have lost throughout the duration of his recovery. Liam, who has just turned 15, is the leading junior male runner with the Mackay Road Runners Club, as well as racing and placing very competitively against the more experienced runners in the senior division. Based on his recent running efforts, Liam is expected to place highly in the 5km Fun Run, if not take out the event. Karen is performing very well in many aspects of her running, deservedly earning herself a personal best time in the 8km Mengs Cross Country a couple of weeks ago – good luck at the Mackay Marina Run – go Karen! Jo, who works as a secretary for Kelly Legal, is a novice runner who enjoys varying her athletic training by going to the gym, walking and playing Basketball. Jo did the 5km Fun Run in last year’s Mackay Marina Run and enjoyed the event so much that she has stepped up her training regime this year to better her 2010 5km time by joining her fellow co-workers on a weekly basis to train for the prestigious event. The Kelly Legal Team are finding the camaraderie of getting together after work for a short training session has many positive benefits for everyone. Jo has already attended a couple of the Mackay Road Runners Club races, in particular, she enjoyed a 5km run at the Tilse Toddle a couple of weeks ago with eighty other competitors. She said the feeling of running with so many like minded, easy going people makes training heaps easier and much more enjoyable. Even though Jo has a very busy agenda, she always makes time to fit in exercise most days of the week, even if it’s only a short training session. She said “The Mackay Marina Run has it all – a race distance to suit everyone in a great environment”. Stuart has been running for a very long time – in his High School years up to 1962 and in his adult years from 1975 to present day. At Scots College in his senior year (1962), Stuart was the open sprint champion, Cross-country champion, overall open champion and Captain of the athletics team. In those days he could run the mile in 4mins.50secs. In 1961 (age 17 yrs), he won the Warwick mile. In 1962, he won the Toowoomba half-mile and came second in the Toowoomba Mile. From 1975 to 1992, he continued running non-competitively to keep fit. 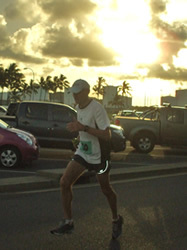 Since 1992, he has competed in 9 other Gold Coast half-marathons and 2 full Gold Coast marathons. 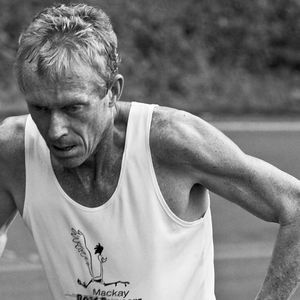 In Mackay, he has competed in approx 6 half-marathons and his aim always was and still is to finish. He can still finish a Half Marathons in under 2 hours. He has always enjoyed the Gold Coast Marathon the most because of the atmosphere, and the Mackay Marina Run is fast catching up to that. Stuart has been on the Mackay Road Runners committee for approximately ten years and has held the positions of Results Coordinator/Handicapper in the past and is currently the Course Marker with Jeanette Farrugia. Stuart is a gentle, humble and very helpful person, who doesn’t say a lot, but can be quite competitive when racing, as he always likes to give his best and he loves challenge. He has been known to out-sprint many of his much younger rivals who have the upmost respect for his competitive nature. Stuart came third out of all Mackay Road Runners’ Members at the 2010 Awards night in the prestigious Handicap Points Trophy for earning the third most handicap points for the entire running program from February to October. The Handicap Points Trophy is very hard to win, as runners need to maintain consistent running based on their handicap for the whole year. Stuart is also very intelligent when it comes to injuries, as he always rests to ensure that his recovery is as fast as possible. Stuart is looking forward to this year’s Mackay Marina Run and has stepped up the training with a view to running another time well under two hours.